We are providing an exclusive range of Paper Tape for packaging purposes in various industries. 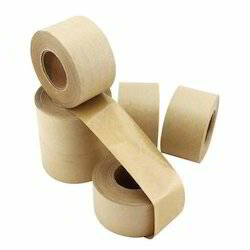 Made using superior grade kraft paper, the offered tape is broadly used and appreciated by our valuable clients. Offered tape is quality tested on various parameters to ensure its flawlessness. We offer this paper tape in various specifications and can also be customized as per the individual needs of clients.